Martin Feeney (James Frecheville) is a former Irish soldier in the British Army in 1847 who returns home in Connemara, West Ireland. When he arrives home, he finds the whole country deeply affected by great famine. Feeney finds bitterly that his mother died of hunger, and his brother was hanged after stabbing a man when his family was evacuated. Feeney lives with his widow’s widow who is trying to overwhelm and raise his three children. His plan is to emigrate as soon as possible to America and take his brother’s family with him there. Before leaving, the Anglo-Irish local agents and members of the RIC organization arrive to take them out of the house. During the evacuation, the house is destroyed, Feeney is arrested, and his nephew is killed. Feeney is interrogated by the RIC, but manages to kill those who captured and destroyed the barracks. When he returns home, he finds his brother-in-law and granddaughter dead because of the weather, and they are forced to sleep among the ruins. The destruction of the barracks draws the attention of British authorities who suspect that Feeney is responsible. 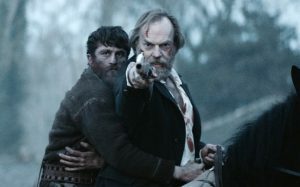 He is in fact an army deserter, and Pope (Freddie Fox), an arrogant British officer, is assigned to handle his capture, being helped by Hannah, who fought with Feeney in Afghanistan . Because she is threatened with a death sentence for a previous crime, Hannah has no choice but to help capture Feeney, although the soul does not leave him because Feeney saved his life on the battlefield.